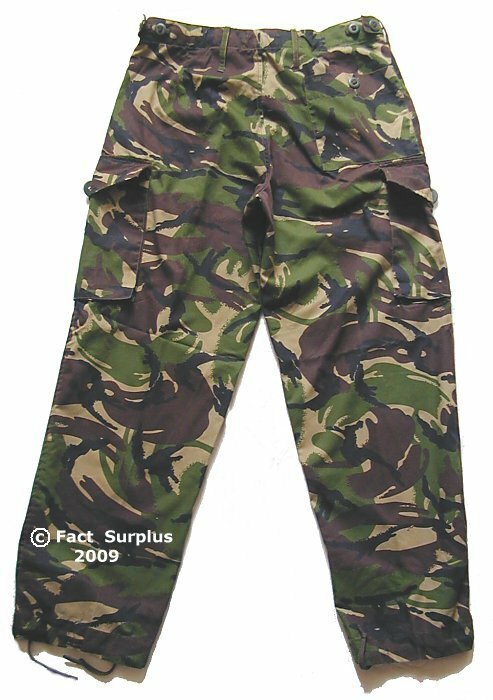 Genuine issue British Soldier 95 S95 combat trousers. DPM camo. 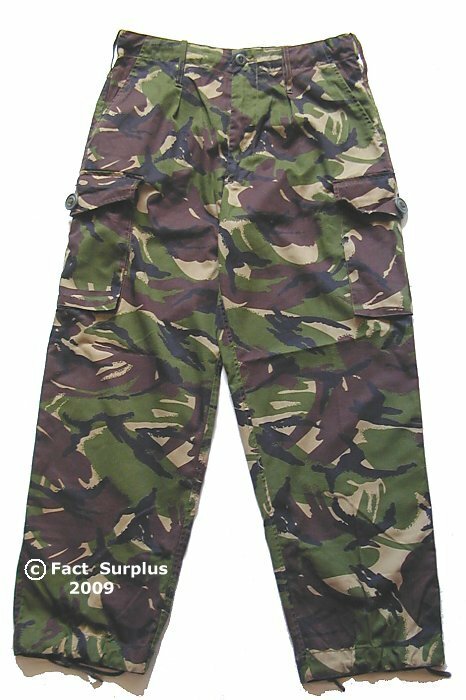 Lightweight poly cotton trousers with 2 front pockets, 1 rear and 2 big cargo leg pockets. Chunky Canadian pattern buttons. 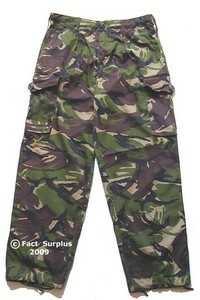 Drawstring waist and button waist adjusters. 3 inch belt loops. Zip fly. 30" waist. 26" leg. NATO 7075/8085. Br.72/80/96. 30" waist. 28" leg. NATO 7580/8085. Br.75/80/96. 30" waist. 30" leg. NATO 8085/8085. Br.80/80/96. 32" waist. 28" leg. NATO 7580/8085. Br.75/84/100. 32" waist. 30" leg. NATO 8085/8085. Br.80/84/100. 32" waist. 32" leg. NATO 8590/8085. Br.85/84/100. 34" waist. 26" leg. NATO 7075/8590. Br.72/88/104. 34" waist. 28" leg. NATO 7580/8590. Br.75/88/104. 34" waist. 30" leg. NATO 8085/8590. Br.80/88/104. 34" waist. 32" leg. NATO 8590/8590. Br.85/88/104. 36" waist. 28" leg. NATO 7580/9095. Br.75/92/108. 36" waist. 30" leg. NATO 8085/9095. Br.80/92/108. 36" waist. 32" leg. NATO 8590/9095. Br.85/92/108. 38" waist. 30" leg. NATO 8085/9500. Br.80/96/112. 38" waist. 32" leg. NATO 8590/9500. Br.85/96/112. 38" waist. 34" leg. NATO 9095/9500. Br.90/96/112. 40" waist. 32" leg. NATO 8590/0005. Br.85/100/116. 40" waist. 34" leg. NATO 9095/0005. Br.90/100/116. 40 - 41" waist. 32" leg. NATO 8590/0005. Br.85/104/120. 40 - 41" waist. 34" leg. NATO 9095/0005. Br.90/104/120.